Abraham, the father of the Jews and Arabs came from Ur in Iraq. 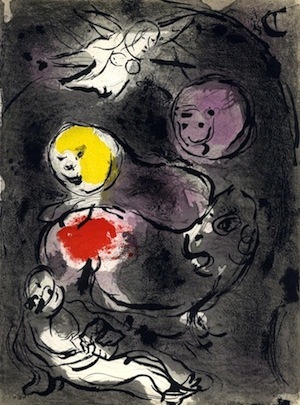 (Genesis 11:3-32) Abraham picked a bride from Iraq for his son Isaac. 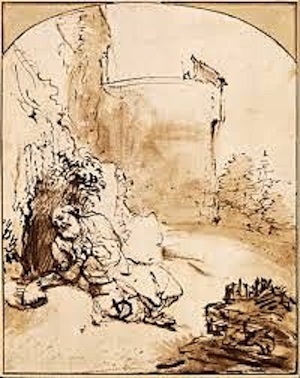 (Genesis 24:3-10) Jacob, Isaac’s son, spent c. 20 years in Iraq. 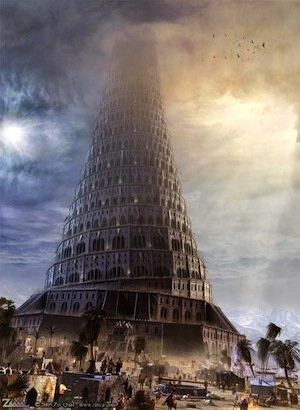 (Genesis 27:42-45; 31:38) The Babylonian Empire in Iraq attacked the Jews and Jerusalem fell to them in c. 588 BC. Significant numbers of the Jews were taken to Babylon in Iraq where they remained in captivity for 70 years. These were the days of the prophet Daniel (c. 770-750 BC) of the Lion’s Den fame who died a captive but respected wise man in Iraq. Jonah, writing c. 785-750 BC, was the prophet who did not want to tell Nineveh in Iraq to repent and was swallowed by a giant fish. On Nabi hill of Yunus in Iraq near Mosul a shrine dedicated to Jonah, believed to contain his tomb, was a site of pilgrimage for both Muslims and Christians. People from all over the world came to see this ancient shrine. On July 14, 2014, ISIS destroyed the tomb because they thought it was idolatrous. The events in the book of Esther take place in Iraq. (c. 460 BC) The Biblical prophet Nahum prophesied against Iraq. (Nahum 1:1-14) The New Testament contains prophecies against a figurative Babylon in Iraq in the End Times. (Revelation 17-18) The Old Testament is mainly about the Jews, but second to Israel, Iraq is the most mentioned nation in the Old Testament. 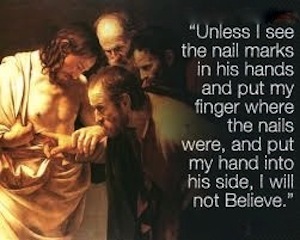 Doubting Thomas and other early disciples brought Christianity to Iraq in the 1st century AD. The northern parts of Iraq became the center of the Eastern Rite of Christianity and Christian literature from the 1st century until the Middle Ages. 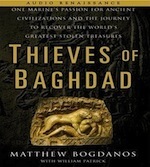 No one was prepared for the pillaging of Baghdad’s Iraq Museum in April 2003, but a fast-thinking Marine officer Col. Matthew Bogdanos, improvised an investigation—and helped recover thousands of stolen antiquities. 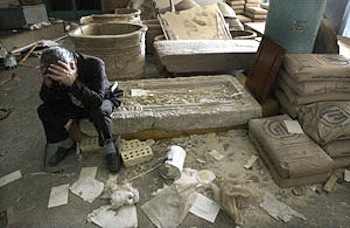 The thieves took or destroyed 15,000 archeological treasures from thousands of years ago and when they looted the National Library in Baghdad the same month, they destroyed and burned one million books and ancient documents including ancient copies of the Koran. 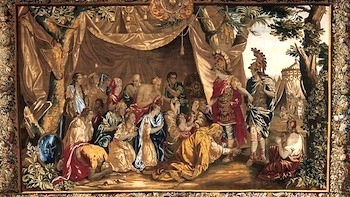 Looting has been a part of war at least since 333 B.C., when Alexander the Great strolled into the tent of King Darius III, helped himself to the vanquished Persian’s best tapestries and commandeered the royal bathtub for a soothing victory soak. In the years since, victors have taken the spoils, and in their wake, ordinary citizens and opportunistic thieves have grabbed anything of value in that confused pause between war and peace. 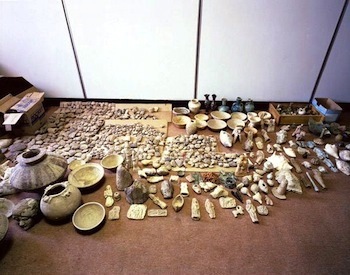 All the looting at Baghdad’s Iraq Museum had taken place by the time U.S. troops—engaged in toppling Saddam Hussein—arrived to protect it on April 16, 2003. Between April 8, when the museum was vacated, and April 12, when the first of the staff returned, clubs in hand, thieves had plundered 15,000 items, many of them choice antiquities: ritual vessels, heads from sculptures, amulets, Assyrian ivories and more than 5,000 cylinder seals. Before the war, leading archaeologists had warned that the museum was vulnerable, but neither Iraqi officials nor invading troops were prepared for such aggressive plunder. There was nothing like the World War II-era Monuments, Fine Arts, and Archives task force poised to secure, track down and recover Iraq’s venerable treasures. 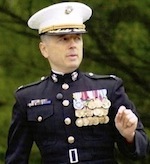 But there was the ‘Pit Bull,’ also known as Marine Col. Matthew Bogdanos, a reservist, classics scholar and amateur boxer, who had earned his civilian nickname as a homicide prosecutor in New York City. Over the next few weeks, stolen goods began to trickle back, including a 6000 B.C. pot wrapped in a 21st-century garbage bag and the Sacred Vase of Warka (c. 3200 B.C. ), in the trunk of a car. Objects were unearthed from backyards, fished out of a cesspool, recovered in pre-dawn raids. Some simply reappeared on museum shelves. Other treasures were seized from international antiquities markets in Jordan, Lebanon, Syria, Kuwait, Saudi Arabia and New York. 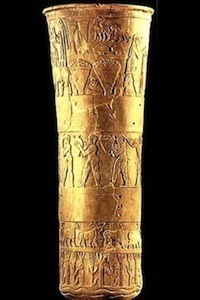 A scholar returning from the war zone was collared at John F. Kennedy International Airport and convicted of smuggling three 4,000-year-old cylinder seals from the museum’s collection. And as the investigation unfolded, it developed that hundreds of the most valuable items missing from the museum—including a cache of gold jewelry from Nimrud—had not been stolen at all but stashed, since the Gulf War of 1990-91, for safekeeping in Iraq’s Central Bank. George (Donny George Youkhanna) estimates that about half of the 15,000 looted treasures have either been returned or secured in other countries until they can be safely repatriated. Still missing are thousands of cylinder seals, a famous eighth-century B.C. 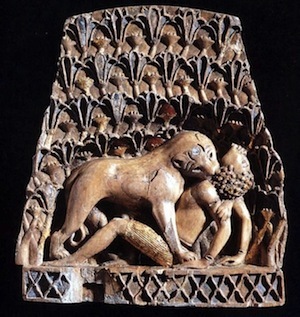 gold-and- ivory plaque known as The Lioness Attacking a Nubian and choice pieces of statuary from the ancient city of Hatra. An optimist with an archaeologist’s long view of history, George believes that in the fullness of time, all of the antiquities will be returned. Meanwhile, many of Iraq’s 12,500 archaeological sites continue to be vulnerable to looting, and the Iraq Museum remains closed, its treasures bricked up within interior storage rooms. “The museum must be the last place to be opened after everything else is completely secured in the country,” says George. 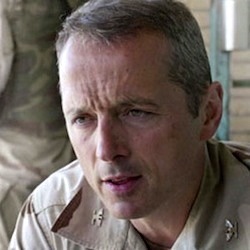 After two tours in Iraq and service in the Horn of Africa and at the Pentagon, Bogdanos returned home to New York City in 2005, in time for the publication of his book, Thieves of Baghdad. 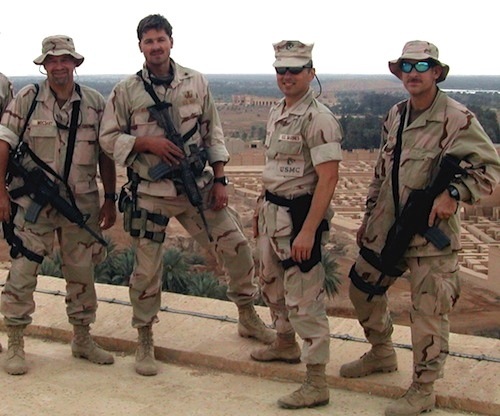 (All royalties are being donated to the Iraq Museum.) He continues to investigate the Iraqi thefts as chief of a newly created antiquities task force in the New York County district attorney’s office. “Until every last piece stolen from the Iraqi Museum has been recovered and returned to the Iraqi people,” he says, “I will continue to be haunted by what is still missing,” says Bogdanos.—End of Smithsonian Magazine article. CLICK HERE to order Thieves of Baghdad. The Baghdad Museum officially reopened in February 2015. At the same time in February 2015, ISIS was destroying with sledgehammers and drills artifacts in the Museum in Mosul. This one minute ISIS video captures that incident.